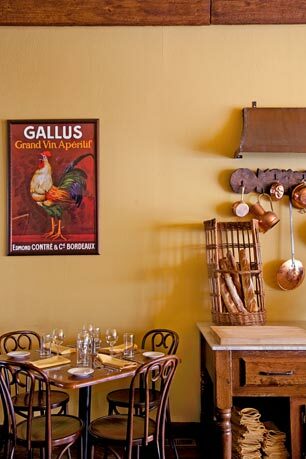 Old world country French flair is part of the appeal of the popular Main Line BYO, A la Maison bistro. A la Maison returns to Spring 2011 Main Line Restaurant Week with a 3 course dinner for $30. With Valentine’s Day quickly approaching, we thought we would celebrate one of the Main Line’s most romantic dining spots—Ardmore’s A la Maison bistro. One very lucky AML fan will win a $100 gift certificate to the bistro by commenting below between now and 9pm Thursday, February 10th, 2011. A fabulous French Bistro and BYO located in the heart of the Main Line, the winner will experience classic French comfort food in a relaxed setting accented by old world country French flair and great service. A la Maison returns to Spring 2011 Main Line Restaurant Week with a 3 course, prix-fixe dinner for $30. For those looking for a fantastic dining experience for Valentine’s Day, Executive chef Sean McMonagle put together a special prix-fixe ‘aphrodisac’ menu complete with caviar, clams, lobster bouillabaisse and more. Happy Valentine’s Day and good luck Main Line foodies and friends! A la Maison serves lunch and dinner Monday through Saturday. A la Maison is located at 53 West Lancaster Avenue in Ardmore, PA. You can make reservations for Valentine’s Day via OpenTable by clicking here or call: 484- 412-8009. Hi! I just have to say that I’ve heard how delicious a la maison is and I want to try it sometime soon! Thanks for all the great info about what’s going on on the main line! My wife and I had a fantastic lunch date at A La Maison! Food is definitely superb! Wow! This place looks SO yummy! I would love to try this place! It looks lovely. Could go to A la Maison for a romantic date sometime soon! I could walk to a la maison, but have never been. Would love to win this! Been twice and loved it both times! holy cow- that calentine’s menu sounds lovely!! would love to try this restaurant! Would love to try!!! The vday menu looks ridiculous! I would love to try this place out. Looks adorable and delicious! This would be perfect for valentines day! I’ve always wanted to eat here! Would love a gift certificate to try it! Thanks. Never been to A la Maison but always wanted to try it! Looking forward to trying this neat little BYO! Looking forward to a nice dinner here with my husband very soon! I know when we visit we will be trying the Fourme D’Ambert, Coqua Vin, and whatever wonderful dessert you are offering that evening! The fact that you are BYO is awesome as well! I want to eat there & pretend that I am in Paris with not a care in the world. Looks delicious and I’ve heard great things so far. Oh, my sister raves about A la Maison, and every time I walk by to go to MilkBoy or Trader Joe’s the smell about knocks me over. Count me in for the drawing! Yummy. I’ll need to head to La Masion workout facility on the mainline after eating here. PERFECT combo, me thinks!! Would love to win this and try A la Maison; we love BYO’s and would be thrilled to try this one! We would love to give this place a try! I really want to try this place!! Looks AMAZING! I need to go there! I LOVE this restaurant! Always great food. This place looks amazing. Keeping my fingers crossed. I have been looking forward to trying this restaurant … have heard wonderful things. Would love to try this place out have heard great things!! Can’t wait to try this one! Foods looks amazing! Yum! Love the foods described above. Looks like a great place to try. This is a wonderful restaurant! I would love to win the gift card! Yum! Love A La Maison! i would love to win the $100!! Had a great meal there a couple of months ago and would LOVE to go back. Heard a lot of great reviews! Hope to have an adult night out! We love A La Maison! We most recently enjoyed it with a big group of friends on New Year’s Eve and it was perfect. I’d love to go back with just my husband for a romantic night out. Thanks! ooh la la, great giveaway! Sounds like an AWESOME place for a romantic night out!!!! Wow! The menu looks yummy. Looking forward to trying it out. The food here is awesome. Can’t wait to go again. This menu looks fabulous! I really want to try A la Maison. My parents just ate there and said it was fab. Would love to try it myself! would love to send my daughter and her husband to this romantic restaurant which is near where they live; she is expecting and has a two year old and could use a night out at a wonderful restaurant and I get to babysit my grandson; thanks so much for offering this!! I had an exquisite lunch at A la Maison. Am looking forward to tasting the amazing sounding evening fare at some point! Had an exquisite lunch at A la Maison! Looking forward to sampling your amazing sounding evening fare soon. My friends and I often go to lunch and always have a great experience. One of my friends will even ask the Chef to make something special for him and they always oblige! Great atmosphere and food. I love this place! The best part – its walking distance to my house! A la Maison is wonderful! Definitely a romantic spot for Valentines Day. WOW! This would be an absolutely fabulous treat for my husband and myself! We could use this more than anything!!!!!!!!!!!!!!!!!!!!!!!!!!!! I work right near A la Maison, and it’s a favorite for lunch! One of my favorite BYOB bistros. Very continental atmosphere, excellent food and friendly servers. I’ve never had the pleasure of dining at A la Maison bistro, but i would love to change that very soon! kudos to the owners of the restaurant for having this giveaway! I could use a night out on the town! I’d love to eat here & experience this restaurant! So excited to have this close by! I just got married and would love to take my new hubby to this super cute French Bisto! La Maison Bistro is one of the best restaurants on the main line! My first time there, I went with my dinner group, and I loved it so much that I took my boyfriend 2 days later. Great food, great prices, great ambiance. i’ve been wanting to try A La Maison since i moved in to the neighborhood. Great little place. I’ve only eaten at the bar. My husband and I would love to try A La Maison! The A la Maison menu looks delish! Love A La Maison! Great food and un-stuffy, French country-like warm and friendly atmosphere…kudos to the staff! As a Philly girl, but true Francophile, I would love an excuse to leave the city’s red brinks behind for a night in the burbs indulging in fine French cuisine at A La Maison. That would truly be Magnifique! Can’t wait to try this adorable restaurant right in the neighborhood! We would love to try it! Going there is like taking a mini-vacation to Paris. And the mussels are the best I’ve ever had!!! Love their seasonal menus. It is always fun to dine at new restaurants! I have heard about the delicious food at your restaurant and we have been meaning to get a babysitter to get a chance to go!! I know people who travel from an hour away to go out to dinner at your restaurant so that is intriguing! Yum! My boyfriend and I would love to try the delicious cuisine at A la Maison. We Need a night out! Pick me! I would love to try this place out! Heard it’s terrific and…ummm…let’s be honest: FREE trumps all the other BS nice-nice reasons we’re all giving! My whole family loves this place -from my 75 father to my 16 year old son. The mussels are terrific. A great place for dinner or a special celebration. My wife and I would love to try this place! Would absolutely love to try this place!!! That Vday menu sounds amazing! i live so close but have never been—would love to try it! I love BYO’s and have heard great things about this place. Would love to go the A La Maison! We’ve been and had a wonderful dinner and great service! We def plan to return!! We’d love to check this place out! I would absolutely love to try this place! Count me in! I love a good BYO! My friend Matt is always talking about this place! Would love to try it!!! My husband and I would love to visit!!! !